Try the proven program used by award-winning International performer and instructor SAQRA to overcome her own stage fright. THIS PROGRAM IS SPECIFICALLY FOR MIDDLE EASTERN DANCERS!!!! For rush order contact Saqra@saqra.net for special shipping instructions, otherwise all videos & CDs are shipped USPS Media Rate. The eyebrow touch point totally works...I often found myself doing the "Turkish headache" gesture anyway, so now its easy to incorporate that in if I start feeling a little lost during performance. Count me as a happy customer and a happier dancer! I just wanted to send an e-mail and Thank you from the bottom of my heart! I purchased the hypnotherapy cd last week and had a chance to listen to it for 4 days prior to my performance on Sunday night. It was the first time in 1 1/2 years of performing in public that I didn't break down and publicly cry from the stress of it all! Not only did I leave my troupe mates with the jaws on the floor at my 360 turn around, but also I had fun... and for that I will be eternally grateful to you and your wonderful cd! We have a few students in class who have complained about stage fright and not only will I be recommending your cd/program to everyone, but I will have an article in our quarterly newsletter! I love the stage fright CD. I already feel more confident and comfortable. It's helping so much. My rehearsals have gotten more productive *and* low key. Email subject: Oh. My. God. Tonight's performance was my best *ever*. I have never been so happy to dance before. All that tension I'd had that made me so queasy - gone. I had so much fun. My dancing improved by an order of magnitude tonight. (DSIR) Drum solo techniques - 5 basic shimmies, improvising with builds, "pop" and "lock" techniques & combos. (DV1) "Classic" Knee Shimmy; Counted Shimmy; Modern Egyptian Shimmy; Turkish Shaking Shimmy; Pendulum Shimmy; Slide Shimmy; Single Shoulder Shimmy; Double Shoulder Shimmy; Rib Side Shimmy; 9 Different 3/4 Shimmies; Shimmy Build Techniques; 2 Special Fringe Effects - Opposition Rib Circles, & One Hip Traveling Circles & more. Run time: Approx. 1 hour DVD $22 - Prices include shipping to US. (DV2) Single Leg Weighted Shimmy; Single Leg Unweighted Shimmy; Semi-Weighted Shimmy; Push Shimmy; Twisting Shimmy; Choo-Choo Shimmy; Multiple Kinds of Glute Shimmy; 2 Linear Rib Shimmies; 10 Different 3/4 Shimmies; Shimmy Build Techniques; Special Fringe Effects - Tail Tornado & Peacock Tail & more. Run time: Approx. 1 hour DVD $22 - Prices include shipping to US. (DV3) Down Shimmy; Arched Shimmy; Arched Twist Shimmy; Hip Drop Shimmy; Freeze Shimmy; Heel Tap Shimmy; Diphragm Flutters (3 different breakdowns); 3 Different 3/4 Shimmies including the ever-elusive 3/4 Vertical Twist; Shimmy Build Techniques; Special Fringe Effects - Shoulder Rollover & "Tahitian" Eights & more. Run time: Approx. 1 hour DVD $22 - Prices include shipping to US. (DVALL) All three disks from the DRUM SOLO DANCE VOCABULRY SERIES. Run time: Approx. 3 hours - Some repeating explanation material is on all three disks. DVD $57 - Prices include shipping to US. FEATURED CDs - Washington/Oregon Bands! 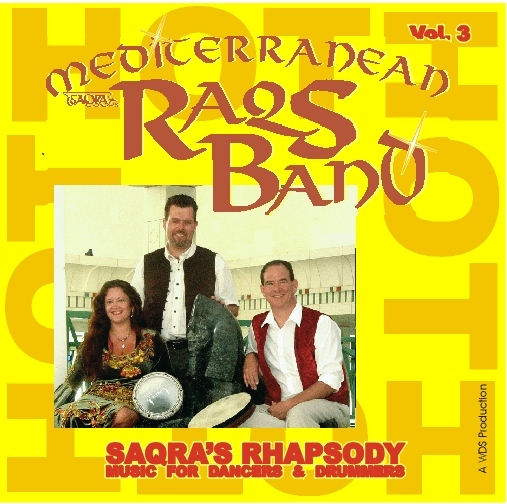 The RaqsBand CDs are also available through www.raqsband.com and are sometimes discounted there. There are also some clickable links to HEAR the music. 7 Bongo Drum Solo 4:41 WWRD? 2. Tiny Taqsim :30 Original short slow improv. 3. Drum Solo 2:49 Drum solo. Bet you guessed that. 7. Set: Ascherat Siroon, Yarus, Drum, Finale 7:40 Live recording:Armenian “Ascherat” song made known in US by CA-based Mirage band, slow song aka “Erev Shel Shoshanim,” hot drum solo and finale! 16. Gole Sangam 2:47 Persian: “Flower of stone” love song. 17. More Cowbell Solo 1:52 Drum & Cowbell Solo! 20. Tamrahenna 3:32 Probably a tribute to an Egyptian woman. 5. Alf Leyla Wa Leyla 5:39 “1000 Nights & A Night” Overture. Made famous by Egyptian Uum Kulthum. 12. Mavi Mavi 2:57 Turkish folk. Be happy, lovely blue eyes. 20. Ya Eyn Moulayyeteyn 4:03 Saidi/Egypt Folk. “I see two women” and I raise them a little extra drum solo. NO LICENSING NEEDED TO USE FOR CLASSES, VIDEOS, OR WORKSHOPS. 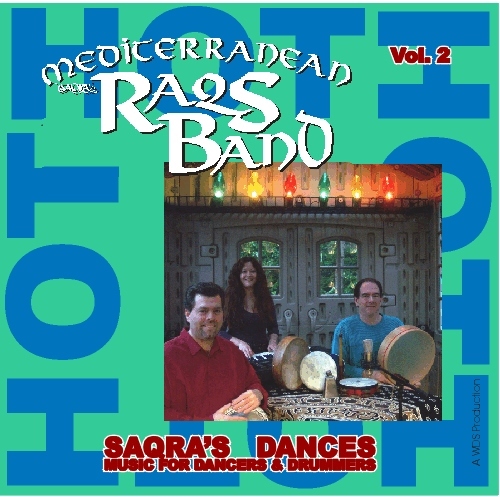 This CD is intended for the fitness informed Oriental (Belly) dancer wanting something for a regular aerobic dance workout. It is assumed that the dancer is of intermediate to professional level and has experience executing steps and combinations to tempo. There are no instructions issued during the recordings, only gradual controlled increases and decreases in rhythm tempo with an upper bpm (beats per measure) limit that is appropriate in length, speed and duration for training. 1 - 25 min Maksoum drum track beginning at 100 BPM and progressing up to 150 BPM, then cooling back down to 100 BPM. 6 minutes of warming, sustained higher level workout of 15 min, 4 min of cooling down. 1 - 30min Saidi drum track beginning at 100 BPM and progressing up to 160 BPM, then cooling back down to 100 BPM. 5 minutes of warming, sustained higher level workout of 19 min, then 6 min of cooling down. Also included are 2 - 1 minute tracks suitable for calming yourself or for taking a full minute pulse count if you are not wearing a watch. Live CD features short routines! Each of the 21 songs is separate so you can cut and paste your selections or use routines directly as on the CD! Suitable for both cabaret and more ethnic styles. Multi speed music. Excellent for all levels of dancer.